When the flowers start to bloom and pollen is in the air, the bug population begins to grow. Insects start to reproduce and start increasing in numbers. Keep your home and family safe with a professional spring bug prevention program from Bug-Man Pest Control. Since the weather is getting warmer and it is breeding season for many insects, spring bug prevention is a good idea for your home. Treat early and ensure you prevent the pests from spreading in and around your home before it becomes a serious problem. You can expect to see many different insects when the weather starts to warm up. These are some of the top insects we target in our spring pest control program. Termites - Most people are familiar with the destructive effects that termites can bring to their home. These insects will burrow into your wooden structures and cause severe damage. Bed bugs - Bed bugs can live in your home all through the year. These insects invade your bedding. While you sleep, they will bite you. German roaches - German roaches are found living in your kitchen and bathrooms to start with. They are attracted to wet locations and will find food sources wherever possible. Rodents - Rodents can be a big problem in your home during the spring. Rats, mice, and squirrels are problematic to your home. These animals carry diseases and are harmful to your health. Ants - There are many different ant species that invade Jacksonville. In order to keep down on these insects, you need spring pest control. They come in through small holes in your home and look for food sources. Mosquitoes - Mosquitoes can breed in a few inches of water. Any standing water in your yard your around your home can cause them to multiply quickly. Wasps - Wasp nest begin increasing in size and numbers as spring moves along. Females will enter your home through small voids in search for a suitable place to build her nest and care for her young. Spiders - Most spiders are good for your yard since they eat other insects. However, some people do not want spiders taking up residence in their home. Black widow spiders - Black widow spiders are not the kind of spider you want in your home. Their bite is poisonous and they should be avoided. 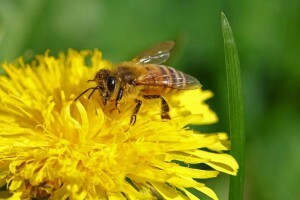 Stinging Insects - During this time of year, you can expect to see bees out for pollination. Other stinging insects such as hornets and yellow jackets are a problem. If you are dealing with any of these common spring pests, Bug-Man Pest Control is here to help. We offer a comprehensive spring bug prevention service that will keep the insects at bay. Contact us today to set up an appointment to rid your home of common spring pests.